1. Corn Gluten Meal - It is a natural weed and feed fertilizer. It should be broadcast to prevent grassburs, crabgrass, and other annual weeds that germinate from seed. The key is to broadcast the material before the weed seeds germinate. Possibly its best use is around root crops, bulb plants like onions and other transplants. CGM on the bare soil around the young plants feeds to help develop big healthy plants while keeping the competing weeds at bay. CGM can also be used with this method in seed planting but only after the seeds have grown into small seedlings. 2. Crabgrass Killer - Agralawn Crabgrass Killer is a natural weed killer used to kill crabgrass, chickweed, and other similar weeds. Cinnamon bark is the active ingredient. This product is especially effective on clovers of all kinds. It is applied dry to moistened foliage and kills quickly without hurting most turfgrasses. This is currently the only selective natural organic herbicide. 3. Fatty Acid and Plant Oil Products - There are several of these fancy, strong soaps and plant oil products on the market including EcoSMART, Monterrey Herbicidal soap, Scythe, and Racer. They are non-selective herbicides that usually have to be sprayed more than once. 4. Flame Weeders - Red Dragon is the specific brand I have tried and it works on many tough to control weeds. There are small lightweight models for the homeowner and large commercial selections as well. They run on propane gas. Of course, be careful using any fire producing device. 5. Molasses - Dry or liquid molasses can be used to kill off hard-to-control weeds - even nutsedge. The dry product is used at 20 lbs. per 1000 sq. ft. as a fertilizer and fire ant repellant. Doubling that rate causes a herbicidal effect on certain weeds. Liquid molasses used at about a cup per gallon of water kills nutsedge. It usually takes 2 or 3 applications and the nutsedge slowly dies away. 6. Vinegar - The best choice for herbicide use is 10% white vinegar made from grain alcohol. It should be used full strength. I've mentioned 20% in the past, but it is stronger than needed and too expensive. There is one exception. Nature's Guide now has a 20% vinegar legally registered to be sold as an organic weed killer. 7. Hand Tools - Hand weeding is still legal and recommended and it doesn't take that much time if done a little at a time on a regular basis. Regular hoes, stirrup hoes, weed poppers and twisters are among the choices. 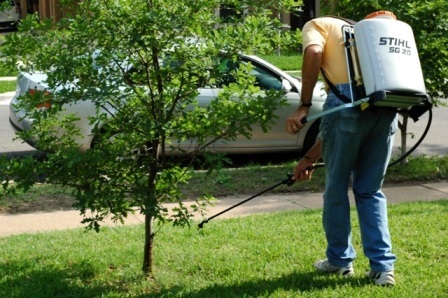 Vinegar sprayed on the bases of trees and other woody plants will not hurt the plants at all. This technique was first learned about by spraying the suckers and weeds growing around the bases of grapevines. Use only natural vinegars and avoid all vinegar products made from glacial acetic acid. P.S. If you haven't already, join me Sunday 8-11am CT. Check this page Radio Stations on DirtDoctor.com for stations coast to coast and border to border.